Comet 219456A Driven Clutch. 6" DIA., 5/8" BORE. REPLACES COMET 217610A. 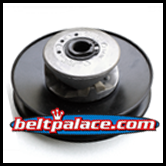 MANCO 5958 Pulley, ASM 13373 Part. Comet 219456-A Driven Clutch. COMET INDUSTRIES MODEL 31D, 6" DIA., 5/8" BORE. REPLACES COMET 217610A, Manco 5958, ASM 13373. 219456A Driven Clutch. GENUINE COMET INDUSTRIES MODEL 31D-6. 6" Diameter, 5/8" Bore, 3/16" Keyway. American Sportworks/ASW - ASM 13373 Secondary Pulley or MANCO "MAN13373". 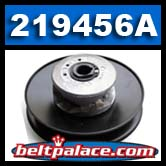 OEM Replacement: Comet 219456A, Comet 217610A. Requires 3/4" Wide Asymmetric Drive Belt. Standard V-Belts WILL NOT work. Genuine Comet Industries 219456-A Clutch. MADE IN USA! Manco Part 8191 (7� Dia. DRIVEN 30S-7, #217611). Comet 203942A. BUSHING BRONZE 21D 31D for Driven Pulley. Comet 203942A. Part Sequence #2: Bronze Bushing for 20/30 Series Driven units and Torq-A-Verter 2.